Animal House 40th Anniversary Celebration – Save the Date! Jan - 08 | By: Oregon Film | 6 comments. 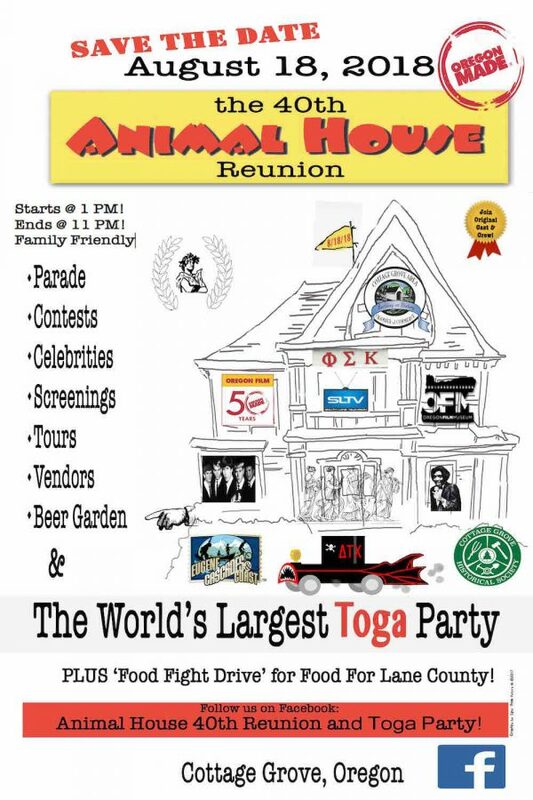 We are excited to be a part of a celebration coming to Cottage Grove this August in honor of the dishonor that was “Animal House.” The Eugene and Cottage Grove shot film was released in the summer of 1978 and it is time to get together and have a massive Food Fight, Toga Party and put ourselves on Double Secret Probation – what else is summer for? Check out the poster below for more details and like the event’s Facebook Page to be in the in Double Secret loop. Thank you, Oregon Film for this! TOGA! Where is the toga party going to take place? Can you send a copy of the complete schedule of events? When I open it in FB, the font is illegible when I enlarge it. We don’t believe the full schedule has been published yet, but we will pass along your email and question to the event organizers. I attended the 25th year celebration. It a guaranteed great time. Come join us for a World Record! !